I know an elderly person who suffers from the gout and so did a bit of looking into it. 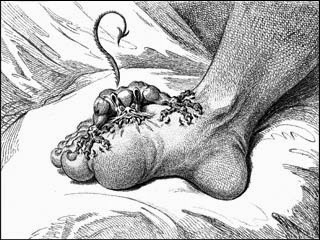 Gout is a well known disease that was rare until last century. Prior to that it afflicted the rich and wealthy. The symptoms of gout are caused by a buildup of uric acid crystals in various joints- particularly the feet, ankle or knee but, can be present in any other joint. Gout is associated with various other conditions eg high blood pressure, heart disease, diabetes, obesity and increased blood triglycerides, increased small dense LDL cholesterol and decreased HDL cholesterol. Gout is unknown in hunter gatherer societies. For those familiar with the primal - paleo diet the above picture will sound familiar- ie unknown in primitive societies, rare in the west till after the industrial revolution, greatly increased incidence in the last few decades. It is the balance that is critical ie for uric acid to build up input must be greater than output (loss). meat and shell fish are largely protein which increases uric acid excretion by kidneys. eating protein increases uric acid excretion by kidneys. This includes protein from meat and shellfish. alcohol increases uric acid production and reduces its excretion. It is well known that gout patients under excrete uric acid from the kidneys. It should be no surprise to learn that insulin inhibits uric acid excretion by the kidneys and that a higher carbohydrate diet will result in greater levels of insulin production. Remember gout patients usually have diabetes (or are pretty damn close) have insulin resistant cells and so must synthesise a lot of insulin. A person with insulin resistance (ie secreting large amounts of insulin due to cells less sensitive to insulin) and on a high carbohydrate based diet would be expected to build up uric acid. This would all seem to indicate a higher protein diet, reduced high glycemic index\load carbohydrates (eg no grains but vegetables with some fruit). One trial of this was done and published in 2000. Back then, the idea of high protein diet replacement drinks was considered radical and needed a prescription in some countries. Now you can buy them off the shelf at your local chemist or supermarket. Times change. It be no surprise to learn that using a paleo diet for gout is not widely known and the most widely recommended gout diet is based on limiting protein and increasing grains and refined sugars foods. This is also well known to have only a small effect, if any, on the gout which is usually described as "difficult to treat". Dessein, Shipton, Stanwix, Joffe, Ramokgadi (2000) Beneficial effects of weight loss associated with moderate calorie/carbohydrate restriction, and increased proportional intake of protein and unsaturated fat on se rum urate and lipoprotein levels in gout: a pilot study. Ann Rheum Dis59(7):539-43. There may be other trials out there as well. Researchers out there.... there may be an oppurtunity here for a clinical study of paleo diet for gout sufferers or if you are very conservative a somewhat higher protein, low glycemic index, low glycemic load trial for gout sufferers. Mediterranean would be expected to work better than the conventional western diet but a primal paleo diet would be expected to work better. Now many gout sufferers are elderly, although, gout does also affect young persons. Gout sufferers often, as outlined above, may be suffering several disease and may reap significant benefits from a paleo diet and life pattern. In these cases, "to much, to soon" can be as much as problem as "to little, to late". Medications will need to be monitored and may need to be reduced over time by your doctor (who you have told about your dietary changes etc and knowing your full diagnosis\history etc is keeping an eye on his\her patient). A conservative, gentler approach could be to transition across to a paleo -primal diet over weeks rather than the "its Paleo Day 1 today" approach. An example of one way this could be done is by shifting to lower glycemic index\load foods (ie cutting back on grains\dairy and shifting to vegetables and some fruit) with meat\eggs\shelfish\fish served as a portion in every meal (including breakfast- as the conventional diet often lacks breakfast protein) ie a Mediterranean style diet for a couple of weeks and then transitioning to a paleo - primal diet. There are various methods which could be applicable but in all cases there is a need for medical input and monitoring.